Encamped among the hedrons of Emeria high in the air above Tazeem, Gideon Jura has sent envoys across the world to gather allies for a desperate last stand against the Eldrazi. The city of Sea Gate, once a beacon of learning and culture, swarms with Eldrazi, but Gideon has chosen it as the site of this battle. Here, he will rally the people of Zendikar and show them that victory over the Eldrazi is within their grasp. Allies have come. Drana of House Kalastria brought vampires from Guul Draz. 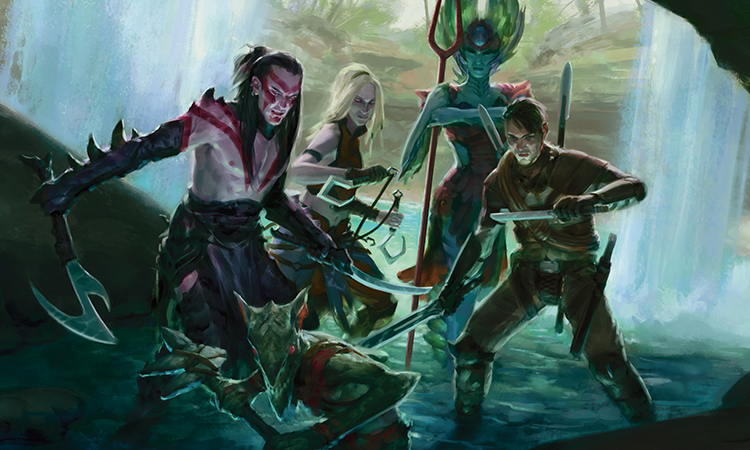 The roguish merfolk Noyan Dar brought a contingent of "roilmages" whose magic controlled the violence of Zendikar's roil. Warriors and refugees from around the world have united under Gideon's banner. He has assembled the greatest host Zendikar has ever seen. People began scrambling down from the hedrons as soon as the first sliver of sun rose over the distant horizon. It was slow going—the ropes and ladders connecting the hedrons were not meant for the passage of so many people at once. When Gideon reached the ground, he found half an army waiting for him already, gathered from camps that had formed in the hedrons' shadows when space on the hedrons themselves grew too crowded. He shouted, "For Zendikar!" and a deafening roar came in answer. When Gideon had led the survivors from Vorik's camp up into the floating hedrons of Emeria, they had numbered in the dozens—very few dozens, he had thought at the time. And many of them had been injured—some, like Vorik himself, had died of their wounds within days. But in the weeks since, groups of straggling refugees had come, one after another, so gradually that he had barely noticed how large the camp had grown. Healers had been working, with very little rest, to bring as many soldiers as possible back to health so they could fight again. Now Gideon led an army—a ragtag, motley assortment, to be sure, but an army of hundreds, and not just a few hundred. It was truly Zendikar's army, drawn from every part of the world, even frozen Sejiri, which had been nearly deserted before the Eldrazi arose. Kor, merfolk, and elves marched alongside humans, and even goblins and vampires had joined the ranks. Gideon smiled as he looked them over. "Gideon's Irregulars," he said to himself, conjuring bittersweet memories of his youth on Theros. He and his friends had been a ragtag, motley assortment as well—a far cry from the rigid soldiery of the Boros on Ravnica. 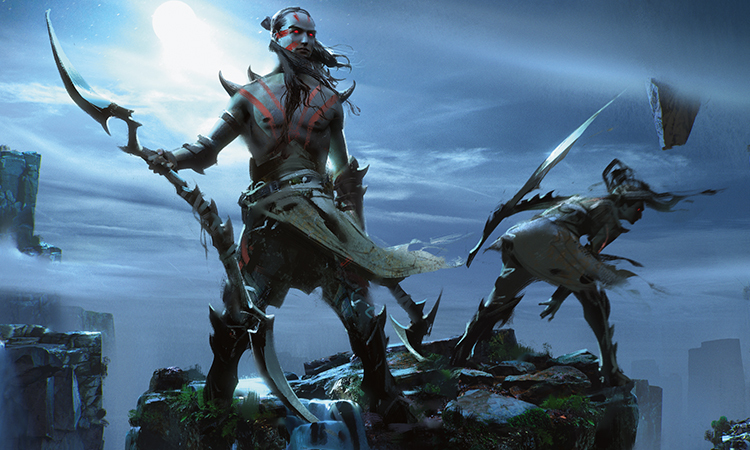 Now, with Gideon at their head, this ragtag army—Zendikar's army—began its march to retake Sea Gate from the Eldrazi. The first Eldrazi they encountered were tiny spawn, scattered across the rocky hillside like grazing sheep. Each one stood at the end of a trail of bone-white dust, the devastation left behind from its feeding. Gideon gave a yell and charged down the hill, and a dozen eager soldiers followed him. His sural swept around, slicing and grabbing at the Eldrazi, while his allies' spears and swords slashed and stabbed at the squirming, tentacled things. Somewhere to his right, far beyond his reach, a soldier screamed. Gideon paused, looking around for the source of the cry, but then more spawn rushed at him. The spawn fell quickly under the initial charge, and the host behind him built up a terrible and exhilarating momentum toward the city, like a wind at Gideon's back. Soon he was running, shouting, waving his weapon in the air like a banner, plunging headlong into another mass of Eldrazi closer to the city. These were larger, and their deaths were not so quick. Weapons cut through bony plates and hacked through writhing tentacles, but Gideon heard more cries of pain rising above the shouts of battle, as sharp bony claws slashed and stabbed, and flesh blistered at the Eldrazi's touch or crumbled into dust. The army kept surging forward, as inexorable as the Eldrazi swarms, cutting through the enemies of Zendikar. Gideon knew only the battle: the irregular rhythms of his sural sweeping and cracking, of Eldrazi attacks clattering against his shield or rebounding from a burst of golden energy that warded his skin. The rhythm of his feet moving, forward and back, but always more forward than back. Closer and closer to the white stone of Sea Gate, to the lighthouse that soon came into view, touching the sky. Forward, ever forward, with Zendikar's army at his back. 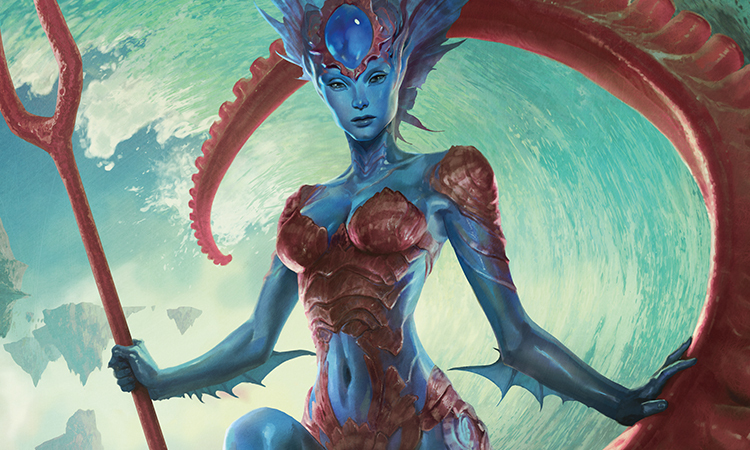 A jagged tentacle erupted out the back of a merfolk soldier just to Gideon's left. I could have stopped that, Gideon thought with a wrench of his gut, but there was no time to dwell on his error. A mass of writhing tentacles topped by a bony head engulfed a trio of soldiers to his right. He sprang to attack it and severed its head with one quick stroke, but all that remained of the three soldiers was dust seeping out through the tentacles. He'd been too slow. A huge, bony hand swept a nearby kor up from the ground and raised him high into the air. Gideon vaulted after him, slashing at the arm and bashing his shield into the Eldrazi's face. The hand contracted, blood spurted out between the fingers, and the monster and the kor fell to the ground together. So many of the Zendikari were dying. So many men and women, following his lead, were running headlong to their deaths. Suddenly he was back on Theros, a brash young man hurling Heliod's spear at the god of death. And the Zendikari around him, the ragtag army he had fondly compared to his Irregulars, were now dying just as his original Irregulars had, paying for his foolish mistake, his arrogance. The burden of those four deaths would never be lifted from his shoulders. Four. How many hundreds more would he carry after this day? He shook his head to clear it, and realized that his forward press had cut him off from the rest of the army. Slashing a wide arc through the Eldrazi around him, he turned back to his troops. The advancing forces had been brought to a standstill, and now a sea of Eldrazi churned between him and the rest of his army. So many of them were dying. No longer a tight wedge driving toward Sea Gate, the army had spread out, and Eldrazi had wormed their way in among the soldiers. Defensive formations were broken, their offensive charge had ground to a halt, and the soldiers were tired, he realized. How many hours had they been fighting? Most of the day was gone. The Sea Gate lighthouse was still a distant beacon across a teeming field of deadly enemies. And Zendikar's army was faltering—dying. Munda, the kor leader they called "The Spider," was a few yards off to his right, swinging the complex tangle of ropes that had earned him his nickname. Like Gideon, he had pushed too far ahead of the bulk of the Zendikari forces, and his strength was flagging. Gideon cut a path to stand beside him. "Come on," he said. "Back to the army," Gideon said. "We need to rally them." Munda cast a glance over his shoulder at the army, at what had once been a coherent front line. "They need more than that," he said. Despite his misgivings, Munda moved in step with Gideon, back to back. The two of them had often ventured out from the camp to hunt Eldrazi, and they fought well together. But more and more Eldrazi pressed themselves into the gaps left by the constant motion of their whirling weapons. "For Zendikar!" Gideon shouted as the ragged line of soldiers parted and enfolded him. The answering cry was heartfelt, no doubt, but it was weak. "To me!" he shouted, and the soldiers began the laborious work of coming back into some semblance of a formation. "We're not going to win this," Munda said. "Not today." Gideon's stomach lurched. Defeat was not an option he was ready to consider. "Another day," Munda said. "If we live to see another day." "Retreat," Gideon said, half to himself. "Retreat!" a soldier near him shouted. It was a kor he'd seen before, a sentry from the camp. Blood ran from her forehead down past her eye, streaking her cheek like tears. "Retreat!" Munda echoed, and the cry passed through the ranks. Gideon felt it almost immediately: What had been a sense of forward momentum, almost a palpable pressure behind him, released, and in its place was a gentle pull as the rear of the army began to fall back. "Retreat!" Gideon shouted, bracing himself to guard the rear of the retreating army. Disciplined troops could maintain formation while moving away from the enemy, protecting themselves as they withdrew. For a few moments it seemed like Zendikar's army might be able to manage such a retreat. Munda stayed close beside him, helping him shield the troops at their backs. But these were not disciplined troops, for the most part. They were tough, fierce, and determined, inured to the hardships of Zendikar and grown accustomed to the horrors of the Eldrazi. But they were tired, and the Eldrazi pursued them relentlessly. And so many of them had died. The ordered retreat turned into a rout. The sense of a tug at his back became a sucking vortex as the ranks behind him dissolved and scattered like dust. "Hold the line!" Gideon shouted, and the pull diminished ever so slightly. The soldiers nearest to him slowed their retreat and closed formation, but it was too late for the rest. Zendikar's army—his army—was gone. And that left Gideon, Munda, and a small handful of soldiers to hold back the Eldrazi, like the dam of Sea Gate itself holding back the waters of the Halimar Sea. Somewhere far behind him, a horn was sounding a rallying call. It made no difference to him and the waves of Eldrazi crashing against him. But it gave him a direction, in the absence of an ordered host making their retreat. He kept the horn at his back and torturously made his way back into the hills above the city. Eventually no more Eldrazi pursued them, and Gideon put his back to Sea Gate and rejoined what was left of his army. At the top of a rise, Tazri stood beneath a ragged banner amid a scattering of soldiers—she had sounded the horn. As Gideon crested the rise and looked around, he saw clusters of soldiers kindling campfires across the hillside below. As the sun touched the horizon, the army of Zendikar was coming back together. Munda clapped him on the shoulder. "We made it in one piece, friend," the kor said. "Well fought," Gideon said. "And I'm glad to see you, Tazri." "That was a disaster, Commander-General," she said, her tone turning the title into an indictment of his failure. Gideon frowned at her for a long moment while Munda held his breath. "All right, then," he said at last. "What did I do wrong?" "Nothing," she said. "That's just it. You did nothing." Gideon felt his face flush. "Nothing? I must have killed dozens. I saved—" His words caught in his throat. Dozens? Maybe. But not enough. "You are a hero beyond compare, my friend," Munda said. "My own hooks took down—"
"But these people need a commander," Tazri said. "I did what I could. I tried. But they look to you." "I led the charge," he protested, but his heart felt the weight of every death he had been unable to prevent. "That's not the same thing. You led—led from the front, a sterling example for your troops." She scoffed. "And you expected your army to follow you in a headlong charge into the thick of the battle." Gideon frowned at her. "Yes, I expect every soldier in this army to face battle with the rest of us. Nobody's just along for the ride." "You expect every soldier in this army to be another one of you," she said, jabbing her finger at his chest. "Look at them! It's not a thousand Gideons down there." "Fortunately," Munda interjected with a snort. "Yes," Tazri said. "Yes. A thousand Gideons would be a force to be reckoned with, certainly. But what would they do against the flying Eldrazi? The ones in the sea?" Gideon looked down at the army, at the contingents of merfolk and elves, with their harnessed sky eels and flying rays, at the vampires and goblins, at the kor kitesailers and hook-wielders, at the humans from every region of the world. "A thousand Gideons, waving their whips in the air and shouting 'For Zendikar!' as they charge headlong into the foe. Maybe it could work, if they all shared your invulnerability. Maybe they could overcome the Eldrazi, even Ulamog himself, through sheer stubborn force. But that's not the army you have, Commander-General." "You think I don't know that?" Gideon said, looming over her. "I watched them die. So many of them." Tazri put both her hands on his chest and shoved him away, the gleaming halo around her neck flaring brighter. "And I watched them fight! We are Zendikari, Planeswalker. Every person here grew up in a world that seemed determined to kill us all, even before the Eldrazi came. Every race and culture of our world has come up with ways to fight, ways to deal with whatever threats the world throws at us. And few of them involve headlong charges into annihilation!" Her words felt like a knife in his chest. "You inspire these people," she said. "Vorik saw that. You inspired him, too. Even I've felt it. You trust people to be their best, and you make them want to live up to that. But you're not giving them a chance to do it." Gideon threw up his hands. "I don't understand," he said. "What more do they need?" Tazri wheeled back to face him. "A plan!" she said. "A strategy! They need to know how they fit into the army and the overall plan of attack. They need to know that if they do what they do best, they're going to help another part of the army do better. They know what they can do, but you have to figure out how it all fits together and explain it to them." Gideon saw the anguish in her face, heard the confusion in her voice, and suddenly saw her in the midst of the disastrous battle, watching soldiers die and being powerless to help. And he realized that he hadn't just failed his army—he'd also failed his commanders. "Walk with me, Tazri," he said. "Munda, you, too." With two commanders at his side, Commander-General Gideon Jura strode down the hill into the camps of his army. Over the next few days, a plan came together. Gideon met with every commander in the army, individually and as a group. He sparred with soldiers, learned what they could do, and rode on the back of a sky eel. Flying scouts—kor with their kitesails, elves and merfolk on their bizarre mounts, and vampires floating by means he didn't understand—brought him constant updates on the movements of the Eldrazi and the status of Sea Gate. And somehow, even after the slaughter of the previous assault, even with so many soldiers fallen, the army of Zendikar managed an answering shout that rang in his ears. One of those scouts, in the afternoon on the first day, brought an alarming report. She had spotted something in the ocean outside Sea Gate: what looked like an army—a fleet?—of monsters swimming toward the city. 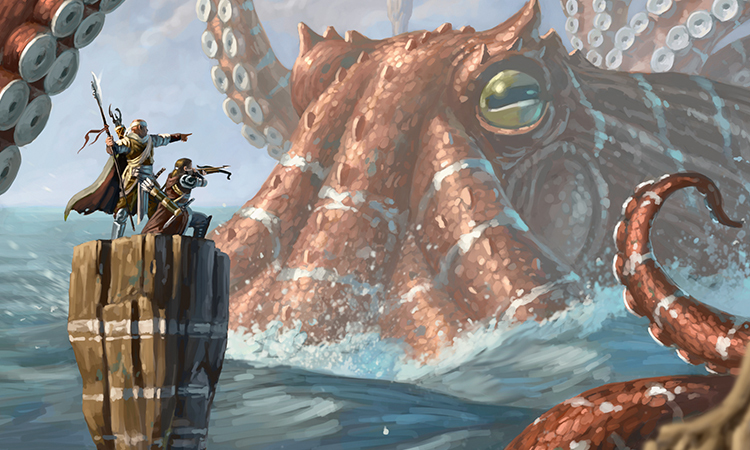 No Eldrazi, but serpents, sharks, giant octopi, and even a kraken or two all surged toward Sea Gate like a tidal wave. Gideon would have been concerned, but the scout added that they were leaving bits of aquatic Eldrazi floating in the water behind them like chum. "Allies, then," Gideon said. "At least for now." The army continued its steady advance, and the lighthouse of Sea Gate came back into view. The sight sparked an excited surge in the troops—Gideon felt the energy build like physical pressure at his back. He felt the excitement as well, but he fought the urge to break ranks and charge forward. Many hours of hard fighting still lay between the army and the walls of Sea Gate. When a scout reported heavy losses on the right flank, Gideon directed more troops there, his orders carried through the host by horn signals. When he heard that a large swarm of flying Eldrazi was approaching from the direction of Halimar, the inland sea, he sent a contingent of eel-riders and archers there to fight them off. He sent goblin forces to fend off a skittering mob of smaller Eldrazi that would have distracted his stronger soldiers from greater threats. The sun began to settle, blood red, into the western horizon, casting the battle against a stunning backdrop of color. Of course, the Eldrazi showed no signs of tiring, and the lengthening shadows didn't seem to impair them at all. Gideon gave an order, echoed on horns, and the front ranks of troops began a careful retreat. Gideon realized that he was holding his breath, and he forced himself to let it out, to trust his troops. This was all part of the plan, and everyone knew it was coming. The ranks of human, kor, merfolk, and elf infantry fell back, and fresh troops advanced into their place—vampire troops. Gideon could feel the tension in the retreating soldiers. Eldrazi in front, vampires behind, and their terrifying bloodchief, Drana, hovering overhead—it felt all too much like being trapped between two enemies. He knew, they all knew, that the vampires fought for Zendikar just as they did. But they also knew that the vampires fed on blood. And the whole army was hungry. But the maneuver went off without incident. The vampires, well rested and unhindered by the darkness, surged forward and tore into the Eldrazi with terrible zeal. Evidently they were able to channel their hunger, their bloodlust, into ferocity in battle. Gideon, and the ranks of soldiers behind him, felt a surge of relief even as the exhaustion of the day's battle washed over them. This was part of the plan where Tazri had overcome Gideon's objections: He rested, ate with the other commanders, and spent the evening discussing plans and strategies. It had been a successful day, and Gideon had to trust that the night would go equally well, even without him fighting on the front line. He even managed to sleep. But as soon as enough sunlight leaked into the eastern sky, he rejoined his troops in the front lines, inspiring the vampires to a fresh surge forward. The wall of Sea Gate, built to protect the city from beasts and bandits, and largely ruined when the Eldrazi overran it, came into view on the second day. The land that divided the Halimar Sea from the ocean outside narrowed quickly until it met the huge white dam of Sea Gate and its crumbling wall. The Halimar side was a gentle slope down to a quiet beach; while cliffs on the other side stretched down to the churning ocean below. The narrowing land presented a unique challenge, exposing both of the army's flanks to attack from Eldrazi that swam or flew. It also descended sharply to the city entrance, making an ordered march difficult. But the problem that commanded Gideon's attention had nothing to do with the terrain or even the Eldrazi. It was the enormous octopus that had half-climbed the cliff alongside the forces, lifting a gigantic tentacle up to them. More specifically, it was the merfolk who perched on top of the tentacle. His soldiers were looking to him for orders, so he shoved his own bewilderment aside and strode to the cliff edge to meet this merfolk. She was striking: Her cerulean skin glistened with water, large fins striped with indigo rose up from her head like elaborately sculpted hair, and she wore an enormous blue sapphire mounted on her forehead in some sort of headdress or crown. And in one hand she gripped a weapon: a strange forked spear made from what looked like red coral, gracefully curved at the end into twin points. It seemed . . . oddly familiar, somehow. "Well, look at this," she said with a smirk. "Have you brought an army to help me take the city?" "I am Kiora," the merfolk said. Gideon's gaze met Kiora's dark eyes. "Gideon Jura," he said. "Commander-general of this army. We have come to retake Sea Gate"—he quirked his mouth in a half-smile—"and are happy to accept your help." She gave a harsh laugh and raised her spear. A wave swelled in the sea behind her, revealing the dark shapes of enormous sea creatures—the "fleet" Gideon's scout had told him about. "And I am commander-general of this army," she said. "I am the Crashing Wave, the Master of the Depths. I have faced a true god—the false Eldrazi gods will not defeat me where Thassa failed." "Thassa?" Gideon said, eyes wide. Of course, the bident. "You have been to Theros?" Kiora winked at him—an unsettling gesture involving the closing of two separate lids on the same eye. "So I am happy to accept your help, Planeswalker." The wave she had summoned crashed against the great white dam of Sea Gate. The ocean churned as sharks and whales, serpents and krakens, tore into the Eldrazi. "The battle of Sea Gate has begun, Gideon Jura. Best hurry if you want to keep up." The monstrous tentacle lowered Kiora back down to the ocean, and another enormous wave swelled in the sea beyond. 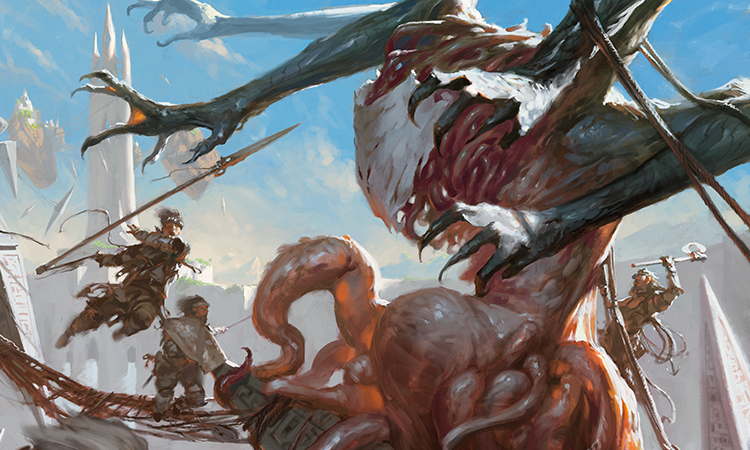 A new surge of Eldrazi, perhaps trying to escape Kiora's waves, was coming at the army, and Gideon shouted orders. 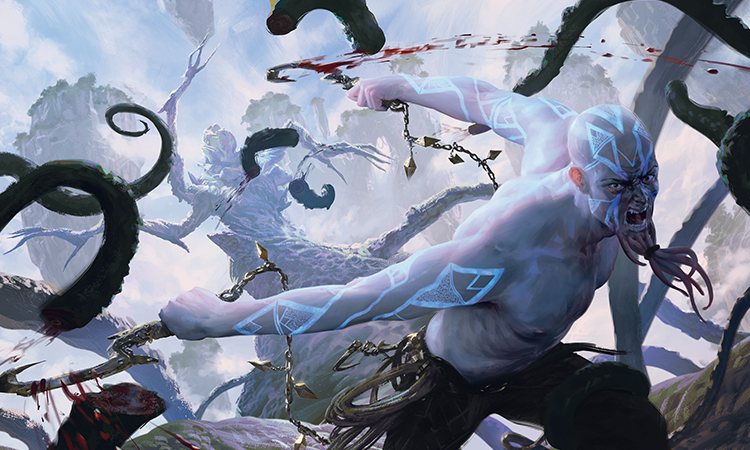 The merfolk Planeswalker's "army" was a force of chaos he couldn't direct, but he could adjust his own army's assault to make the best use of it. Horns sounded to spread his orders throughout the host, and he could feel a renewed energy rush through the soldiers around him. Kiora's forces effectively covered his army's flank on one side, making the task of reaching the outer wall of Sea Gate easier—at least in theory. The greatest difficulty, though, was that Eldrazi were constantly streaming out of Sea Gate, wandering away in search of whatever passed for greener pastures in their minds, and the terrain channeled them directly into the path of Gideon's army. There could be no more skirting around the greatest concentrations of Eldrazi. They had to face the enemy head-on. He felt the eagerness of his troops. With the walls of Sea Gate in view, they wanted to surge forward, to charge the enemy and sweep them from the land. He recognized the impulse, but held the front line to a slow and steady march. There would be no repeat of their first reckless charge. Forward, ever forward—but so much more slowly. The Eldrazi were a rushing deluge streaming out from the city, and every forward step was hard-won. When another night fell, Drana's vampires filled the front ranks again and tried to maintain their position, but their numbers were too small to hold back the flood. The force of Kiora's aquatic assault seemed to ebb with the night tide as well. The vampires were forced back and back until they reached the camps behind them, and weary soldiers were awakened in the middle of the night to hold the Eldrazi off in the darkness. The difficult night made for even slower progress the next day. But by the time the sun finished its descent, the army had reached the outer wall of Sea Gate. Cheers went up along the front lines as soldiers touched the stone, laying their hands upon the wall in acts of familiar reverence. For many of them, Sea Gate was home, and even for the rest, the wall represented a milestone on the road to victory. A third of the wall was rubble, and another third was chalky dust, but at least it channeled the Eldrazi's movements somewhat. Taking up defensive positions—even if they were on the wrong side of the wall—helped the vampires hold the Eldrazi back through the night so the other soldiers could rest. And on the next day, the fourth dawn since they began their march, the army of Zendikar surged through the wall and entered Sea Gate. Gideon couldn't even measure whether they were advancing or retreating anymore. While squads of soldiers cleared and claimed one block of buildings, the Eldrazi circled around and attacked a different one behind them. Some soldiers had nearly reached the lighthouse, but others were still fighting Eldrazi back at the wall. He wasn't even sure what a retreat would look like, but the Eldrazi were everywhere and his soldiers simply couldn't be. He had to figure something out. He paused for a moment, looking down at a gigantic Eldrazi squirming in its death throes, and felt the stone trembling under his feet. "I need eyes!" he shouted. "What's coming?" A merfolk on a huge eel dipped down near him. "Zendikar!" she cried. "Zendikar has come to fight with us!" "Trees and stones! The land rises up to destroy the Eldrazi!" Gideon couldn't understand—until he saw the first elemental lumbering past. 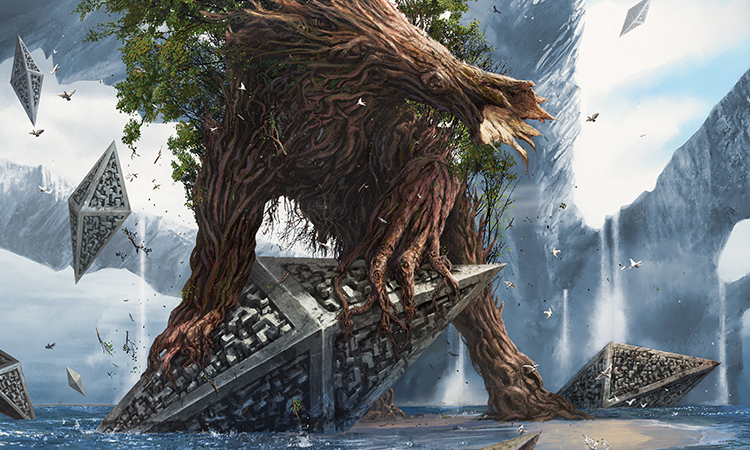 Its shape was like a giant beast, but its head looked like an ancient oak, with a gaping maw amid the roots, and its legs were massive tangles of wood and vines. Each step shook the stone, and it swept its head back and forth as it moved, throwing Eldrazi to the side. More elementals came into view, looming over buildings and lumbering down wide streets. They were wood and leaf, vine and branch, boulder and bedrock. And a few streets over, standing between two arched wooden horns atop a towering elemental, he saw an exultant elf, hands and eyes glowing green. Nissa had returned. And she had indeed brought Zendikar with her. Noyan Dar's roilmages had chanted about the world's destructive power: "The world heaves! It shakes! It strives! It destroys or it dies!" And here the world was doing just that, not in the unpredictable and indiscriminate roil, but in the forces of nature embodied in animate forms, marching at Nissa's command. Gideon could feel the tide turn. His soldiers were more inspired and excited than he had ever seen them. Zendikar was a harsh world, and most of these people had grown up with a sense that the world was trying to kill them. But now, in a very concrete sense, the world was fighting alongside them, killing their enemies. Crowds of soldiers were falling in behind the elementals, cheering them on and killing any Eldrazi that escaped the grip of roots and the bludgeoning of stone. "Take me up!" he shouted to the merfolk, still hovering on her eel just overhead. She lowered her eel closer, and Gideon clambered up, first to the roof of a nearby building and then onto the eel's saddle, perched behind the rider. Together they rose above the city, so Gideon could see all the parts of his army working together. While he was working with the commanders to formulate the plan for the attack, he had often returned to the metaphor of a body, with all its parts working in concert. Now he could see the truth of it. 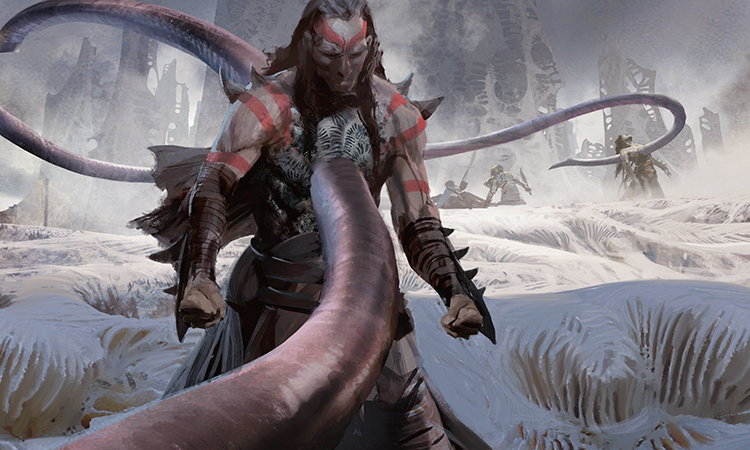 The two forces—Zendikar's army, with its soldiers and sea monsters and elementals, and the swarms of Eldrazi—were locked together like two wrestlers. Each of them occupied about half the surface of Sea Gate's dam, with the lighthouse between them. The elementals had helped clear away the Eldrazi that had worked their way past the front lines, so the Zendikari had a solid grip on their half of the city. And the Zendikari had the upper hand. They were going to win! At Gideon's command, the eel-rider let him down near the lighthouse. He shouted orders, and horns carried them throughout the host. Soldiers marched, kitesailers lifted into the air, scouts slipped among the buildings, and victory drew closer. Beyond the lighthouse, the battle became gradually less intense. Instead of fighting upstream against a flood of Eldrazi leaving the city, the Zendikari were driving the Eldrazi before them out of the city at its other end. The creatures still fought; they seemed as intent as ever on turning the Zendikari into food or dust. But the Zendikari had momentum on their side now. When they paused for the night, Drana's vampire soldiers had little difficulty holding the Eldrazi back. And it was barely noon on the next day when a quiet fell across the city. A moment later, a cheer went up near the wall and spread throughout the troops. His heart pounding, Gideon signaled for an aerial scout's report. "Fighting has stopped, Commander-General Jura," the elf reported. "I can't see any more Eldrazi within the city walls." Gideon needed to see for himself. "The top of the lighthouse," he said. "Can you get me there?" The elf nodded, and Gideon climbed onto the back of the undulating flying ray. A moment later, he climbed through a window at the top of the lighthouse spire and looked out over Sea Gate. The city was in ruins. Many buildings were dust and rubble, and the streets were littered with the bodies of the dead. The mighty dam itself had held, but he could see patches of dusty corruption here and there on the surface. But Sea Gate was theirs. The army of Zendikar had reclaimed it from the Eldrazi. They had won. A signaler joined him at the top of the tower and blew out his orders on her horn—two strong groups of soldiers gathered at either end of the dam, smaller patrols along the Halimar side to watch against Eldrazi coming from the waters, archers along the oceanside wall. They had claimed Sea Gate, but they still had to defend it. Slowly, other commanders joined him, and eventually Nissa arrived as well—and then Kiora. "I have some questions for you," he told the merfolk Planeswalker, grinning. "I bet you do," she said. Before he could ask them, he heard shouting in the city below. Afraid that the Eldrazi had made another incursion, he rushed to the window. A merfolk in white coral armor that contrasted with her reddish skin was running at full tilt, heading for the lighthouse. She was shouting, but he couldn't make out her words. As she entered the lighthouse, he started down the stairs to meet her. Then he finally heard her clearly: "Ulamog!" They met in the middle of the stairway. Panting with exertion, she repeated her warning. The next two Uncharted Realms stories will showcase new characters from Commander (2015 Edition). Battle for Zendikar stories resume November 18!